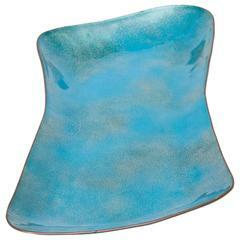 Serie of bowls attributed to Gio Ponti by Paolo De Poli, Italy 1950 Upper site light green turquoise with a turquoise centre eyes Bottom site blue. A second one is available upper site gold bronze, bottom site green. Signed on the bottom "De Poli". Totally reupholstered in green water line velvet. Beautiful pair of stools with "high heels" shaped legs. Totally new upholstery in 1st class dove grey velvet. Made by "Case e Giardini" New cushions cover in "green water" cotton Literature "Sedie, poltrone e divani" L. Aloi, Milano 1952, p.254-255-257. 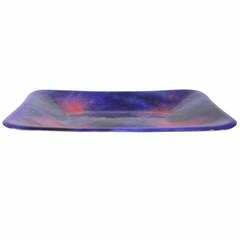 Large, organic enameled tray by Paolo De Poli. Signed. 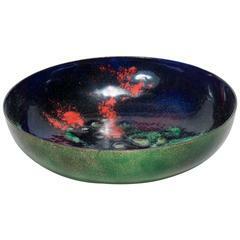 Hand-hammered and fire-enameled copper dish executed in gauzy layers of blue, gold, green, and purple. Signed with Paolo De Poli label to reverse.